Advantages: Succinct overview of the types with extensive walk around pictures, 1/72 scale drawings and 51 individual aircraft profiles and four top and bottom view profiles. This latest addition to the Mushroom Model Magazine Yellow Series is true to form. The monograph is divided into three basic sections: The historical text; the walk around comprised of color photographs of restored aircraft and black and whites of original aircraft; and finally, the numerous color profiles. While the text may be a bit basic for the “Hurricane Boffin”, it is none-the-less an excellent introductory overview of the development of the Hurricane and the Hurricane’s various types and sub-types. The text begins with the history of Sydney Camm’s effort to develop a monoplane based on the Hawker Fury. What one discovers is that the success of the Hurricane was due not only to its design, but also due to reliable technology - the Browning machine gun (Colt MG-40). The author then goes on to give an overview of the Hurricane’s Marks and subtypes, from the prototype through the various Marks used by both the Royal Air Force and Royal Navy’s Fleet Air Arm. The text is accompanied by 1/72 line drawings and period photographs, providing examples of each Mark and sub-type. There is also a section on experimental Hurricanes and further development of the aircraft and it’s armament. Finally, the technical specifications for the primary Hurricane Marks are presented. What one will not find in the text is a combat history of the Hurricane, its use in various theatres of war or by other air forces or in FAA carrier operations, identification by serial number and a certain degree of detail, which I believe is beyond the scope of the author’s intent. For example, while the author does discuss the bewildering issue of fabric-wing and metal-wing Hurricane production and notes changes made, he does not seek to give serial numbers as a reference, nor is the exact nature of the physical differences made as clear as it could have been. Also, other than two profiles, one will find nothing on the Finnish Hurricanes, either fabric or metal wing. The next section is the heart, soul and guts of any Yellow Series monograph. This section contains extensive color photographs of restored Hurricanes, along with some period black and white photographs, so as to present a “walk-around” of the aircraft. The Author, in the beginning of this section, also gives the location of many surviving examples of the Hurricane. In the “walk-around” section, the author wisely, in my opinion, points out that he is not going to give a comprehensive listing of identities (types, Marks, etc), because of problems of parts swaps and record keeping. As with any restored aircraft, the restored Hurricanes pictured in this section, should be considered as modeling on a 1-to-1 scale. Finally, there are the profiles, which are nicely done. They cover a fair cross sections of Marks and markings; even if they did leave out one of my favorites; the Belgian Mk. I with the thistle emblem. And what would profiles be without a dispute over one or two, such as “Collie’s Battleship.” This was an unarmed Hurricane Mk. I Trop (L1669) with fabric wings flown all over Egypt, by P/O M. T. Pattle, to make the Italians believe that the RAF had numerous Hurricanes. 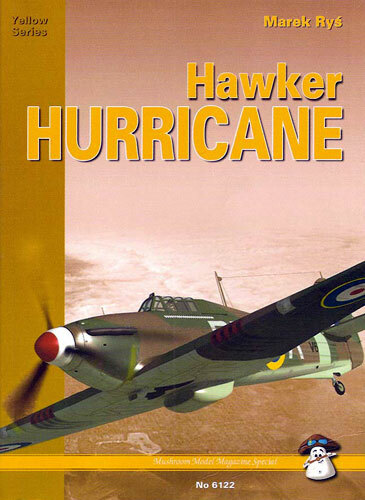 When all is said and done, if you are nowhere near being a Hurricane Boffin, and you are looking for a good and succinct introduction to one of my favorite aircraft, then this book is for you. It will provide one with a good introduction to the Marks and sub-types, and hopefully spur further interest.